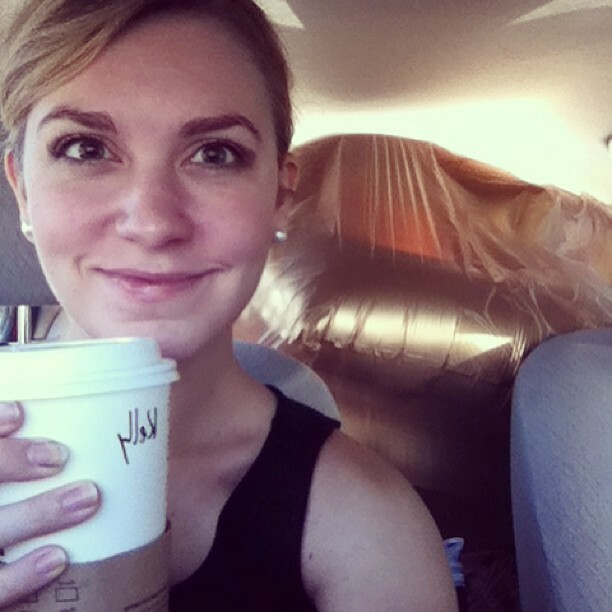 driver's seat selfie after my pitstop at Shindigs & Celebrations to pick up Hayley's fabulous 40" mylar gold foil letter balloons on Saturday! thank you, Jesus, for venti Chai tea lattes and fabulous brides with good taste! I mentioned last month that I'd be tweaking my format for October's life updates, after reading a fabulous self-discovery questionnaire Tami Briggs sent over in a newsletter email. I'm super excited to be analyzing the way I'm living my ideal life (or not) this way! This week marks the last of my officially booked 2013 wedding dates. CRAY CRAY. I've got a pretty possibly packed January so it could be lookin' a little rough after the holidays but as for right now, it's build build build and prep prep prep for 2014.
home environment | My dream is to have a charming two-story Southern home in Mt. Pleasant, South Carolina. That's not our reality right now. However, what IS our reality is the opportunity to maintain a tidy but not meticulously so home where everything has a place, there is minimal clutter, and almost everything is functional and beautiful. I've done an excellent job over the past year in paring down our belongings to essentials and things that fit those two categories, but there is still work yet to be done. Especially upstairs where I seldom venture. Goal: Make upstairs so that it is pleasant, functional, and I will actually use my office. And use it. relationship | The goals I initially set in describing my ideal life relationally have a lot to do with expanding our family. That's not a reality for us right now EITHER. So, as for now, I will focus on new ways to love Drew, honor and respect him, and serve him better as his wife. Goal: Cook more. Continue tidying on the daily. Find ways to occupy myself to be around while he's constantly studying without being distracting. friends & fam | Yikes. I need to call and write and see people more. Goal: Call more. Write more. Set budget-friendly dates more. career | WORK IN PROGRESS. Why, yes, I do have a career. Why yes, it does need some drastic improvement after the crazy learning curve starter year. Strategy. Implementation. Action. No floundering allowed. Serve clients better. Work smarter, not harder. Set business operation hours and stick to them. Teach yoga somewhere, too. Goal: Work hard on the Design Life Project e-course. Figure out what I need to make happen and make it happen. fun & rec | Host parties as budgeting allows. Enjoy Nashville while we're still here (ummm... what is there to enjoy? #burnout). Find fun things to do in the fall and winter. Do them. Host lots of dinner parties. cause or purpose | Go to church more. Do the homework when I'm supposed to for BSF & small group. Volunteer. Shine light. Right now, I want to learn calligraphy. Breaking out my book from Christmas and I'm going to learn SOMETHING. What do you have going on this month? Wedding chaos? Fall festivities galore? I went to the pumpkin patch with my sweet family Sunday afternoon (it was an all day affair) and got my fair share of pumpkins and popcorn and listening to the sweetest little kid giggles. Glorious!